The Flensburg Government (German: Flensburger Regierung), also known as the Flensburg Cabinet (Flensburger Kabinett), the Dönitz Government (Regierung Dönitz), or the Schwerin von Krosigk Cabinet (Kabinett Schwerin von Krosigk), was the short-lived government of Nazi Germany during a period of three weeks around the end of World War II in Europe. The government was formed following the suicide of Adolf Hitler on 30 April 1945 during the Battle of Berlin. It was headed by Grand Admiral Karl Dönitz as the Reichspräsident and Lutz Graf Schwerin von Krosigk as the Leading Minister. The administration was referred to as the "Flensburg Government" because Dönitz's headquarters had been relocated in the port of Flensburg in northern Germany on 3 May 1945. Due to the rapid Allied advance, its nominal jurisdiction at the outset was limited to a narrow wedge of territory running from the Austrian border through Berlin to the Danish border; which, since 25 April 1945, had been cut in two by the American advance to join with Soviet forces at Torgau on the Elbe. Following the capitulation of all German armed forces on 8 May, the Flensburg government lost all direct territorial, military or civil jurisdiction, and all diplomatic relations were withdrawn. The western Allies allowed the Flensburg government to continue to meet and conduct what business it could until 23 May when they arrested its members as prisoners of war, effectively dissolving the government although the dissolution was not formally recognized by the Allied Powers until 5 June. Once it became apparent that Hitler intended to stay and die in the besieged city of Berlin, effective overall command of German armed forces was exercised through the Oberkommando der Wehrmacht (German High Command), which had relocated to Rheinsburg. Anticipating that German-held territory would be split, separate military and civilian commands had provisionally been established on 15 April; under Field Marshal Albert Kesselring at Pullach for forces in the south and west, and under Grand Admiral Karl Dönitz at Plön for forces in the north and east; but then Hitler had stalled on transferring executive military authority to them. On 27 April Wilhelm Keitel and Alfred Jodl, of the Army High Command, met at Rheinsburg with Karl Dönitz and Heinrich Himmler to discuss the war situation now that the fall of Berlin could not be averted. Himmler took the chair as the acknowledged deputy Führer; and, since the disgrace and dismissal of Hermann Göring, Hitler's expected successor. As they were leaving Rheinsberg on 28 April, Himmler asked Dönitz to confirm that he would be willing to serve in a successor government that Himmler might form. That day however, the British and Americans published Himmler's secret proposals for a separate peace in the West (which they had rejected). On 29 April Dönitz received a telegram from Martin Bormann announcing Himmler's dismissal from all posts, and ordering his arrest for treason. Dönitz went to Himmler's headquarters in Lübeck on 30 April to confront him with the accusations, but Himmler denied them as fabricated propaganda. When a further telegram from Bormann that day confirmed both the dismissal and Dönitz's appointment as Hitler's successor, Himmler's position became untenable, and Dönitz summoned him to Plön that night to tell him so. Situation of World War II in Europe at the time of Hitler’s death. The white areas were controlled by German forces, the pink areas were controlled by the Allies, and the red areas indicate recent Allied advances. With Himmler and Göring standing accused of treasonable negotiation with the enemy, Hitler in his political testament had named Grand Admiral Dönitz his successor as Reich President and Supreme Commander of the Armed Forces, and designated Propaganda Minister Joseph Goebbels head of government as Reich Chancellor. Goebbels committed suicide in the Berlin Führerbunker on 1 May. The same day Dönitz accepted the offices of Supreme Commander and Head of State in separate broadcast addresses to the German armed forces, and German people. Residual ministers of the Hitler cabinet, who had fled from the fall of Berlin to join Dönitz at the Wehrmacht barracks near Plön in Holstein, resigned the next day. Suspecting that Bormann might also have escaped from Berlin and be intending to seize power, Dönitz met with Hitler's former Finance Minister Lutz Graf Schwerin von Krosigk and asked him to constitute a new Reich government. Von Krosigk's cabinet first met in Eutin, to which he and his ministerial staff had been evacuated, on 2 May. Later on 2 May, and in view of the rapidly advancing British Second Army forces which were approaching Lübeck, Dönitz met with von Krosigk, Paul Wegener, Himmler and Keitel to discuss the urgent necessity of a further relocation. Himmler argued for a move to Prague, then the last major central European capital city in German hands, and closer to advancing American forces with whom he hoped to negotiate personally, but Dönitz refused to sanction any move outside the borders of Germany. Moreover, the political situation of the Protectorate of Bohemia and Moravia was highly unstable. Dönitz decided instead to proceed to the Mürwik naval academy in Flensburg near the Danish border. The cabinet met in the Sportschool of the naval academy; while administrative offices and accommodation for the various ministries were established on the liner Patria [de], moored in Flensburg harbour. The German High Command, which had moved from Rheinsburg to Neustadt in Holstein two days before, then also relocated to Flensburg, while the SS leadership had been gathering at Flensburg since 28 April. Dönitz avoided including prominent Nazi leaders in his cabinet other than Speer; but included several serving officers in the SS and others who had been closely involved in formulating and prosecuting the genocidal policies of the former regime. Herbert Backe had been the author of the Hunger Plan of 1941, a deliberate strategy for mass elimination by starvation of Soviet prisoners of war and 'surplus' Soviet urban populations. Speer's deputy in the Economics Ministry was Otto Ohlendorf, who had personally directed the murder of hundreds of thousands of Jews and Communists in occupied Soviet territory. Wilhelm Stuckart had been a participant at the Wannsee Conference of January 1942, when the administrative responsibilities for the "Final Solution to the Jewish Problem" had been agreed. Otto Ohlendorf had transferred across directly from directing Himmler's office as Reichsführer-SS; and overall, of 350 staff working in the offices of the Flensburg government, 230 had been members of the SS or other security services. Dönitz's cabinet picks were clearly circumscribed by who was available. Otherwise, and in spite of his subsequent claim that his government was 'unpolitical', the most consistent characteristic of those chosen was a virulent opposition to Bolshevism, and a determination to ensure that the revolutionary events in Germany attending the Armistice of 1918 would not be repeated in 1945. As Dönitz did not then intend any surrender to the Soviets or Poles and continued to identify "Jews and profiteers” as enemies of the German people, he had little compunction over including in his cabinet men with blood on their hands, so long as that blood was Russian, East European or Jewish. For the first few days the post of Minister of the Interior was kept vacant. This had been the office of Heinrich Himmler, but Himmler had been condemned as a traitor, dismissed from all functions and ordered to be arrested in Hitler's Last Testament. Dönitz did not want Himmler's name associated with his new government, but nor could he afford to alienate the SS who remained armed and powerful. He tacitly set Hitler's instructions aside and continued to see Himmler on a daily basis without according him any formal appointment. It was only on 6 May 1945, while final negotiations were in prospect for a capitulation to U.S. General Dwight D. Eisenhower in the west, that Dönitz dismissed Himmler from all his posts, and appointed Stuckart in his place. Dönitz had hoped to be able to appoint Field Marshal Erich von Manstein as Commander in Chief of the Army and Chief of the High Command of the Armed Forces (Oberkommando der Wehrmacht), to which the Army High Command (Oberkommando des Heeres) had been subject since 28 April 1945, but he could not be contacted on 2 May, and so Field Marshal Wilhelm Keitel was kept in post; and in this capacity Keitel signed the act of surrender for the German High Command in Berlin on 8 May. A further factor favouring the continuation of Keitel as Commander in Chief, was the support for him of Colonel General Alfred Jodl, the Chief of Operations Staff of the Wehrmacht, whose retention Dönitz recognised as essential. Jodl was to represent Dönitz in negotiations with the Allies in Reims, France. Admiral Hans-Georg von Friedeburg was appointed to succeed Dönitz as Commander of the Kriegsmarine, and was promoted by Dönitz to the rank of Generaladmiral on 1 May. The Air Force had largely been destroyed or grounded due to lack of fuel, so no new appointment was made, Field Marshal Robert Ritter von Greim remaining Commander of the Luftwaffe. In spite of its repeated relocations, the Armed Forces High Command continued to function, its organisation and structures having been maintained. But the same was not true of any other arm of government. Starting in March 1945, the staff of the various ministries had been evacuated to resort hotels in the Bavarian and Austrian Alps – chiefly in the region of Berchtesgaden, leaving only the ministers themselves in Berlin. On 13 April, the remaining foreign embassies and the diplomatic corps were evacuated to Bad Gastein. Finally on 20 April all the ministers and their personal staffs had been ordered to make their way southwards; but as by then the roads had been cut and there were insufficient transport aircraft available, several ministers (like von Krosigk) had perforce headed north instead. Thus the government of Germany was, at the death of Hitler, split over six centres. The Propaganda Ministry, the personal fiefdom of Joseph Goebbels had remained with him in Berlin, as had the Nazi Party Chancellery under Martin Bormann; while the Luftwaffe High Command had relocated to Berchtesgaden, having been until his abrupt dismissal on 23 April the counterpart fiefdom of Göring. Himmler had retained his personal powerbase in the offices of the SS and security apparatus, which had been established in Lübeck in the north and then relocated to Flensburg. Other government ministries and ministers were then variously located at Berchtesgaden and Dönitz's headquarters in Plön. With the Armed Forces High Command also located in the north – although many OKW personnel had gone south – there was, in consequence, no semblance any longer of a German central government, and most of the members of von Krosigk's cabinet lacked any support staff from their nominal ministries. Dönitz's initial priority was to open communication with the commanders of German armies, and to establish with them their acknowledgement of his new authority as sole Supreme Commander of all German armed forces. He also sought their agreement with his overall policy of negotiating successive partial surrenders with the Western Allies, while maintaining the war against Soviet forces in the east. Key to this was sidelining Heinrich Himmler, Joachim von Ribbentrop, Alfred Rosenberg and other former Nazi grandees who had fled to Flensburg, but whose continued participation in government would preclude any negotiation with the western Allies. Dönitz's intentions in this were, if possible, to split the Allies, and to offer German military units as components of a common anti-Bolshevik front. Failing that, he sought to save as many German soldiers as possible from Soviet captivity by ordering units in the east to retreat westwards and surrender to the British, Canadians or Americans, and by redoubling Operation Hannibal, the maritime evacuation of units trapped on the Baltic coast. At Dönitz's urging, Field Marshal Keitel and General Jodl attempted to direct what was left of the Wehrmacht towards these goals. On 2 May, Dönitz obtained pledges of allegiance from the commanders of German armies in Norway, Courland, East Prussia and Bohemia; these pledges were made to him personally as Supreme Commander, and not as Head of State in a forthcoming government. Otherwise however, Dönitz's policies chiefly demonstrated continuity with the previous regime. The Nazi party was neither banned nor dissolved. Dönitz kept a bust of Hitler in his office; and the uniforms, insignia and protocol of Nazi Germany were maintained, initially including even the 'Heil Hitler' greeting. Following a plea from Speer, Dönitz on 2 May rescinded the infamous 'Nero Decree' ordering scorched earth destruction of German infrastructure and industrial plant; but it was not until 6 May that counterpart destruction orders were rescinded for those territories remaining under German occupation, such as Norway. Moreover, neither summary courts for civil punishment, nor military discipline by summary courts martial were abolished; with military executions for insulting the memory of Hitler being confirmed even after the final capitulation on 8 May. While the presence of SS leaders and their staffs in Flensburg had provided Dönitz with a source of personnel to support his government, otherwise they presented problems. In particular, the SS leadership had access to armed forces that were not under Dönitz's control, and remained firmly loyal to Himmler, whom Dönitz had surmised was personally unacceptable now to both the Western Allies and to the Wehrmacht. Dönitz handled the issue by stringing Himmler along for as long as he could with vague prospects of a possible function in the government. Once serious negotiations were underway for surrender to Eisenhower, Himmler and the SS apparatus had to be got out of the way. On 5 May 1945 Dönitz informed Himmler of his forthcoming dismissal, promising false papers and identities for him and his leading lieutenants if they removed themselves promptly. Himmler called his fellow SS leaders together for a last time that day, and advised them to 'dive down within the Wehrmacht'. By the next day they had fled. This came too late for the concentration camp prisoners within the area who were now within Dönitz's nominal authority, while under the actual control of the SS. These had numbered around 10,000 when Dönitz assumed the presidency; mainly former inmates of the Neuengamme camp outside Hamburg, which had been shut down in preparation for the surrender of the city to the British. Between 16 and 28 April, the prisoners had been moved eastwards and concealed by the SS in a flotilla of unseaworthy ships anchored in the Bay of Lübeck, where they then remained without food or medical attention. At the time, this action had been protested by Rear Admiral Konrad Englehardt on Dönitz's staff, but when the Flensburg government came into being, Dönitz made no attempt to free the prisoners, and his government avoided any subsequent acknowledgement that they had known they were there. On 3 May 1945, the prison flotilla was sunk by the Royal Air Force in the mistaken belief that the ships were being prepared to evacuate leading SS personnel. Over 7,000 prisoners drowned, mainly on the former liner Cap Arcona. On 2 May, while still at Plön, Dönitz was surprised to learn that German forces in Italy had surrendered unconditionally to the Western Allies. The capitulation had been negotiated without Hitler's knowledge or consent, and signed at Caserta on 29 April but did not come into effect for three days. While Hitler had been still alive, Dönitz had followed absolutely his commands to fight on to the last on all fronts. However, he now realized that the Wehrmacht's position in the West was untenable. He believed that surrendering German forces only to the Western Allies could present opportunities to split the British and Americans from the Soviets. Thereon he assumed direction of further German surrender initiatives, exploring opportunities for partial surrender in the West. In the East, however, he continued to order German armies to fight on. On 2 May, he tried unsuccessfully to countermand the decisions of the German commander in Berlin to surrender their forces to the Soviets; and on 3 May, issued orders to the besieged defenders of Courland and Breslau to maintain their resistance. On 3 May Dönitz sent Admiral Hans-Georg von Friedeburg, his successor as naval commander in chief, to the headquarters of British Field Marshal Bernard Montgomery at Lüneburg, with an offer to surrender of German forces in northwest Germany, together with the remaining elements of Army Group Vistula. Montgomery informed Admiral von Friedeburg that he could not accept the surrender of forces fighting on the Eastern Front; and that consequently Army Group Vistula would have to surrender to the Soviets although British forces would accept the surrender of any German soldiers fleeing westwards. He proposed instead, following discussions between Eisenhower and the British government, that he would accept the surrender of all German military forces in Northwestern Germany, Schleswig-Holstein, the Netherlands and Denmark, including naval forces and warships in those areas. Von Friedeburg asked for 48 hours to consider this; Montgomery allowed him 24. The proposed inclusion of Denmark, and the German warships operating there, initially alarmed Dönitz, who wished at all costs to maintain Operation Hannibal, evacuating German troops across the Baltic to Danish ports; but on consideration, he reckoned he might secretly evade the obligation to surrender these ships if they were at sea on the date the surrender came into effect. Furthermore, as it was unlikely that Montgomery would promptly be able to deploy British forces to the Danish islands under German occupation, especially Bornholm in the central Baltic, there was every possibility that the evacuation proceeding there could continue in total disregard of the agreed surrender terms. Consequently, authorized by Dönitz, von Friedeburg returned on 4 May and signed an instrument of surrender for all German troops and ships in the Netherlands, Denmark and Northwestern Germany. This was accepted by Montgomery on behalf of Eisenhower. This 4 May surrender would become effective at 8:00 am on 5 May; so Dönitz ordered all ships involved in Operation Hannibal to undertake a covert final evacuation voyage, while also unilaterally ordering all U-boat actions to cease. One crew in the evacuation fleet refused to set sail; so Dönitz ordered the ringleaders to be arrested for mutiny, tried by summary court martial, and shot. Also, on 5 May 1945, all German forces in Bavaria and South West Germany signed an act of surrender to the Americans at Haar, outside Munich; coming into effect on 6 May. 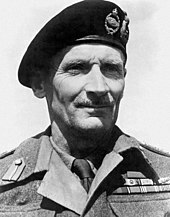 Montgomery, always seeking to boost his own public standing at the expense of other Allied commanders, had arranged extensive media coverage of the 4 May signing, but Dönitz and von Krosigk realised that, although he had supplied von Friedeburg with a prepared German text of the surrender documents, Montgomery had failed to issue this to the press. They consequently broadcast their own, doctored, German version; which differed significantly from that signed; specifically in that warships in the Baltic were not included nor was the territory in Schleswig around Flensburg itself; and especially, the surrender was described as a 'truce', not a capitulation. As was Dönitz's intention, this broadcast exacerbated Stalin's suspicions of the partial capitulations, especially as the greater parts of the 3rd Panzer Army and 21st Army had indeed been able to surrender to the British and Americans, rather than the Soviets. Realising this, Eisenhower determined that no further partial capitulations would be negotiated. The capitulations at Luneberg and Haar could do nothing however for the bulk of German forces in Army Group Centre, fighting the Soviets in Bohemia and Saxony. On 4 May Dönitz, together with Karl Frank the Reich Protector of Bohemia and Moravia, conceived of a device whereby Army Group Centre might be able to surrender to General George Patton's American forces, who had been entering the Sudetenland areas of former Czechoslovakia from the west, and approaching Pilsen. Dönitz proposed that Frank should dissolve the Protectorate of Bohemia and Moravia and resign in favour of a puppet Czech government; who would then declare Prague an open city and invite the Americans in. General Patton's virulent anti-communist views were well known to the German leadership, who reckoned that with Patton in Prague it would become much easier for Army Group Centre to negotiate surrender terms with him while maintaining their resistance to the Soviets, if possible dragging American and Soviet armies into direct confrontation. Frank had hopes that "we can engineer a disagreement between the Western Allies and the Soviet Union even more serious than that of Poland". The ploy was proposed as being put into effect on 5 May, but was overtaken by the outbreak of the Prague uprising on that date; and over the succeeding three days, far from surrendering Prague as an open city, SS forces launched a savage response to the insurgents, with brutal reprisals against Czech civilians and widespread destruction in central Prague. Orders to fire-bomb the whole of the Old Town were only averted due to lack of fuel for Luftwaffe bombing units. Alerted to the German machinations through intercepted Ultra signals, Eisenhower ordered Patton to stand still in Pilsen in spite of ever more desperate calls for help from the insurgents. Prague was finally relieved by General Konev's forces on 9 May 1945. Following the success of the two partial surrenders of 4 and 5 May, Dönitz instructed von Friedeburg to go to the Supreme Headquarters of the Allied Expeditionary Force (SHAEF) to negotiate with General Eisenhower terms for a general surrender of all remaining German armies to the Western Allies. Since von Friedeburg's meeting with Montgomery, Eisenhower's opposition to accepting a German surrender that excluded the Soviet Union had been made clear to the German High Command, but Dönitz hoped to change his mind. On the next day, 5 May, von Friedeburg arrived at General Eisenhower's headquarters at Reims, France, but learned that Eisenhower was resolute that only a total surrender on all fronts to all the Allies could be discussed. Jodl arrived a day later, ostensibly to sign such a general surrender. Dönitz had instructed him to draw out the negotiations for as long as possible so that German troops and refugees could move west to surrender to the Western Powers. Eisenhower made it clear that the Allies demanded immediate unconditional surrender on all fronts. When it became obvious that the Germans were stalling, Eisenhower threatened to close the western front to all surrendering Germans from the east. Had this happened, German soldiers attempting to cross the line to surrender would be fired on and all subsequent surrenders would have to be to the Soviets. When Dönitz learned this, he radioed Jodl full powers to sign the unconditional German Instrument of Surrender at 1.30 am on the morning of 7 May. Just over an hour later, Jodl signed the documents. The surrender documents included the phrase, "The German High Command will at once issue orders to all German military, naval and air authorities and to all forces under German control to cease active operations at 2301 hours Central European time on 8 May and to remain in the positions occupied at that time." The Western Allies had a unified command structure, and formed a single expeditionary force, the "Allied Expeditionary Force". U.S. Army General Walter Bedell Smith (Eisenhower's chief of staff at SHAEF) signed on behalf of the Western Allies, and General Ivan Susloparov (the Soviet liaison officer at SHAEF) signed on behalf of the Soviets. French Major General François Sevez signed as the official witness. Although Eisenhower had sought to keep General Aleksei Antonov of the Soviet High Command fully informed of the progress of the surrender negotiations, no confirmation had been received from the Soviets that the text of the Act of Military Surrender was acceptable to them, or that Susloparov was empowered to sign it. Accordingly, Eisenhower extracted from Jodl an additional signed undertaking that the Chief of the German High Command, and the Commanders in Chief of all three German armed services would attend in person and sign a "formal ratification" of the Act of Military Surrender, at a place and date to be specified. Some six hours after the signing, a response came from Antonov that terms of surrender were unacceptable, and that Susloparov could not sign it. Eisenhower promptly agreed, and undertook to attend together with the rest of the SHAEF for the definitive signing in Berlin two days later. Antonov's response also noted that von Friedeburg had been referring matters back to Dönitz over the radio; and that Dönitz, in direct breach of the signed surrender terms, had still not issued orders for German forces in the east to remain in their positions but was instead instructing them to continue their resistance and flee westwards. Antonov stated that, while the internal discussions of the German military in no way obligated the Allied Powers, Jodl's signature could not be accepted as valid if he was doing so as Dönitz's representative since Dönitz himself was clearly acting in bad faith. He proposed that the definitive act of surrender should make it clear that the Commanders in Chief of each of the German armed services were, in signing it, surrendering their forces on the authority of the German High Command - and not as delegated by Dönitz or the purported Flensburg government. A second, amended, instrument of surrender was accordingly signed at Karlshorst, Berlin on 8 May shortly before midnight. Marshal Zhukov signed for the Soviet High Command, and the British Marshal of the Royal Air Force A.W. Tedder signed on behalf of the Western Allies (Tedder acted as Eisenhower's representative at the Berlin ceremony, and signed "on behalf of the Supreme Commander, Allied Expeditionary Force", in his capacity as Deputy Supreme Commander). French General Jean de Lattre de Tassigny and U.S. Army Air Forces General Carl Spaatz signed as the official witnesses. The Allies had demanded that representatives of the German Army, Navy and Air Force, and the High Command of the Armed Forces, sign the ratification of unconditional surrender, and that they should present full powers authorizing them to do so on behalf of the German High Command. Complying with that demand Dönitz issued a telegraphed communication from his "Supreme Commander Headquarters" (Der Oberste Befehlshaber Hauptquartier) granting the necessary full powers, and accordingly the second Act of Military Surrender was signed by Field Marshal Wilhelm Keitel as Chief of the High Command of the Armed Forces and as acting Commander in Chief of the Army; by Admiral von Friedeburg as the Commander in Chief of the Kriegsmarine (navy), by General Hans-Jürgen Stumpff as Deputy Commander in Chief of the Luftwaffe (air force) as Field Marshal Robert Ritter von Greim, the Air Force Commander, had been injured. At the time specified, World War II in Europe ended. On 9 May, Dönitz issued orders to the German Armed Forces regarding the military surrender. The text of the definitive surrender document signed in Berlin differed from that previously signed at Reims, chiefly in that, to the second article, was added the words "..and to disarm completely, handing over their weapons and equipment to the local allied commanders or officers designated by the Representatives of the Allied Supreme Command"; which had the effect of requiring German troop facing Soviet forces to hand over their weapons, disband and give themselves up as prisoners. Otherwise neither the Reims nor Berlin surrender instruments provided explicitly for the surrender of the German State, because the draft surrender document prepared by the European Advisory Commission (EAC) was not used. Instead, a simplified, military-only version had been produced by the SHAEF, based largely on the wording of the partial surrender instrument of German forces in Italy that had been signed at Caserta. This definition of the surrender as an act of military capitulation side-stepped any Allied recognition of the German Government, or of Dönitz as Head of State. The question of the civil effects of the unconditional surrender was only settled later, when the Allies decided to dissolve the Flensburg Government (23 May) and issued the Berlin declaration, proclaiming the direct assumption of the supreme governmental authority in Germany by the Allied Powers (5 June). The text of the Berlin Declaration was widely based on the EAC's draft instrument of surrender of Germany. The said draft was reworked into a unilateral declaration with an extended explanatory preamble, that spelled out the Allied position that as a result of its complete defeat Germany had been left without a government, a vacuum that the direct assumption of supreme authority by the Allies would replace. During 1944 and 1945 countries that had been neutral or allies of Germany had been joining the Allied Powers and declaring war on Germany. The German embassies to these countries had been closed down, and their property and archives held in trust by a nominated protecting power (usually Switzerland or Sweden) under the terms of the Geneva Conventions. There were counterpart arrangements for the former embassies of Allied countries in Berlin. The United States Department of State had prepared for the diplomatic consequences of the war ending on the assumption that there would have been an explicit statement of unconditional surrender of the German state in accordance with the terms of a draft surrender text jointly agreed by the Allied powers in 1944. In the final days of April 1945 the State Department had notified the protecting powers, and all other remaining neutral governments (such as Ireland), that following the forthcoming German surrender the continued identity of the German state would rest solely in the four Allied Powers. The Allied Powers would immediately recall all German diplomatic staff, take ownership of all German state property, extinguish all protecting power functions, and require the transfer of all archives and records to one or another of the embassies of the western Allies. On 8 May 1945, these arrangements were put into effect in full, notwithstanding that the only German parties to the signed surrender document had been the German High Command. The western Allies maintained that a functioning German state had already ceased to exist, and that consequently the surrender of the German military had effected the complete termination of Nazi Germany. The protecting powers complied fully with the Allied demands: Sweden, Switzerland and Ireland announced the breaking off of relations; consequently the German state ceased as a diplomatic entity on 8 May 1945. Imperial Japan, the only remaining Axis belligerent, had already denounced the German surrender and Flensburg government, and seized the German embassy in Tokyo and seven U-boats. Henceforward, although the Flensburg government had a nominated Minister for Foreign Affairs, it had no access to the diplomatic assets of the former German state and was not accorded diplomatic recognition by any of the former protecting powers or other remaining neutral countries. On 5 May Von Krosigk had dispatched Walter Schellenberg to Sweden as a personal emissary via Folke Bernadotte, hoping to establish diplomatic relations and to expedite a partial surrender of German forces in Norway. This mission was overtaken by the general capitulation of all German forces, and following 8 May all further approaches from the Flensburg Government to Sweden were ignored. Former armaments minister Albert Speer suggested that after the surrender the Flensburg government should dissolve itself. Instead Dönitz and his ministers chose to continue in hope of presiding over post-war Germany as a provisional government. Even though they could exercise no direct territorial authority, the cabinet still met daily at 10.00 a.m. Various papers on post-war reconstruction issues were proposed to be prepared, but the Western Allies showed no sign that they might receive them. Otherwise much time was devoted to discussion of how far the symbols, medals and insignia of the Hitler regime should be retained within the Flensburg headquarters. Some acknowledgement of Nazi war crimes became unavoidable. The departure of the SS leadership from Flensburg opened the way for the Dönitz government to offer its own version of how the murder squads, concentration camps and killing facilities had come into being. Their response was that all these atrocities had been undertaken in secret, and entirely by Himmler and the SS. Dönitz and Jodl issued a joint public statement "that neither the German Wehrmacht nor the German people had knowledge of these things." While this statement was mostly untrue, the consequent myth of the "good Wehrmacht" as having been deceived and betrayed by the "evil SS" was to achieve wide currency for decades in post-war Germany. While it had been agreed amongst the Allies that the Flensburg government should be accorded no official recognition, Winston Churchill proved reluctant to toe the line. In his speech announcing victory to the British people on 8 May, Churchill specified that the surrender had been authorised by “Grand Admiral Dönitz, the designated Head of the German State”. Equally, following the unconditional surrender, Churchill was instrumental in urging that the Flensburg Government should not immediately be closed down, saying that he could see "great advantages in letting things slide for a bit". Churchill's attitude in this was conditioned by his concern that Soviet forces might seek to establish themselves in Denmark; and he saw the temporary continuation of the Flensburg government in territory under British control as establishing a bargaining counter for the British in any negotiations regarding Soviet intentions in the western Baltic, while also facilitating the disbanding of German forces. General Eisenhower tended rather to agree with the Soviet position (if not the reasoning behind it), suspecting that Dönitz and his cabinet could be a front, while the real German leadership, perhaps including Himmler, Martin Bormann and Hitler himself (whose remains were not then known to have been identified), remained operating behind the scenes, or otherwise plotting for their concealment and escape. With ill-disguised reluctance Eisenhower agreed to defer to the British view for a short period, but issued a clarifying statement that the continuation of the Dönitz government did not constitute his being recognised as a head of state "but only and temporarily under the instructions of the Allied Commanders to carry out duties concerning the feeding, disarming and medical care of the German Armed Forces." On 12 May, American Major General Lowell W. Rooks and his British deputy, Brigadier E. J. Foord, arrived in Flensburg and established their quarters in the passenger ship Patria, docked in Flensburg harbour, displacing the administrative offices of the Flensburg government that had been housed there. Their mission was to liaise with the Dönitz "acting government" (as it was then referred to by the SHAEF) and to impose the will of the victorious Allied Powers on the German High Command. Although the liaison mission arranged meetings with members of the Flensburg government, these only confirmed that neither Dönitz nor his ministers had been able to establish any degree of civil authority. Churchill withdrew his protection once it became clear that the Soviet High Command would otherwise have to be represented in the liaison mission. On 21 May the SHAEF acceded to Soviet proposals that the Flensburg Government be dissolved and its members arrested as POWs. The dissolution was carried out on 23 May. On that day, a British officer went to Dönitz's headquarters and asked to speak to the members of the government. Dönitz, von Friedeburg and Jodl were then taken aboard the Patria, where Maj. Gen. Rooks informed them of the dissolution of the government; placing them under arrest, and ordering that they be stripped and searched for concealed phials of poison. The communication regarding the dissolution of the acting government and the arrest of its members was made in a formal manner, around a table on Patria's deck: Dönitz, Jodl and Von Friedeburg sat on one side, with Major General Rooks, British Navy Captain Mund and Soviet General Trusov on the other. Brigadier Foord remained standing, next to Maj. Gen. Rooks, and an official interpreter was also present at the proceedings, that were photographed. By the time Dönitz emerged from the ship, the town's main street was filled with British tanks and troops rounding up the Germans. Faced with the prospect of being strip-searched, von Friedeburg committed suicide, while Dönitz, Speer, Jodl and other members of the dissolved Flensburg Government were taken prisoner, under the responsibility of a RAF Regiment task force commanded by Squadron Leader Mark Hobden. The prisoners were later handed over to the King's Shropshire Light Infantry. Some Flensburg Government POWs such as Albert Speer were subsequently moved to the British POW camp Dustbin in Castle Kransberg, while others, including Dönitz, were transferred to the American-led Camp Ashcan. Later, all Camp Ashcan prisoners were moved to Nuremberg to stand trial. Albert Speer (left), Karl Dönitz (center) and Alfred Jodl (right) after their arrest. 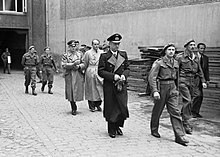 With the arrest of the Flensburg Government on 23 May 1945, the German High Command also ceased to exist, with no central authority having been kept in place to govern Germany even in a nominal capacity, or to assume responsibility for complying with the demands and instructions of the victorious nations. This power vacuum continued for almost two weeks until 5 June 1945, when the representatives of the Allies signed the Declaration Regarding the Defeat of Germany and the Assumption of Supreme Authority by Allied Powers, also known as the Berlin Declaration. The Sportschool in Mürwik, on the edge of the Naval Academy Mürwik, the seat of the Flensburg Government. Therefore, from 5 June 1945, Germany did not possess a native government; complete authority and sovereignty being thereafter assumed by the Allied Military Occupation Government. The contention of the Allied Powers that the German state ceased to exist as of 5 June 1945 was then generally accepted, but came subsequently to be challenged in legal and political debate. In any event, the Berlin Declaration maintained the continued existence of Germany as a national territory, implying the continuation of a German nation. ^ a b Jones 2015, p. 88. ^ Jones 2015, p. 323. ^ Jones 2015, p. 20. ^ Jones 2015, p. 89. ^ Jones 2015, p. 96. ^ a b c Kershaw 2012, p. 359. ^ Kershaw 2012, p. 360. ^ Kershaw 2012, p. 362. ^ Kershaw 2012, p. 361. ^ Kershaw 2012, p. 352. ^ Kershaw 2012, p. 367. ^ Kershaw 2012, p. 369. ^ Kershaw 2012, p. 371. ^ Kershaw 2012, p. 372. ^ The text of the full powers, in German, was as follows: A b s c h r i f t. Der Oberste Befehlshaber Hauptquartier, den 7.5.45. der Wehrmacht /Bitte in der Antwort vorstehendesGeschaftszeichen, das Datum und kurzen Inhalt anzugegen./ICH BEVOLLMACHTIGE GENERALFELDMARSCHALL K E I T E L ALS CHEF DES OBERKOMMANDOS DER WEHRMACHT UND ZUGLEICH ALS OBERBEFEHLSHABER DES HEERES, GENERALADMIRAL VON FRIEDBERG ALS OBERBEFEHLSHABER DER KRIEGSMARINE, GENERALOBERST S T U M P F ALS VERTRETER DES OBERBEFEHLSHABERS DER LUFTWAFFE ZUR RATIFIZIERUNG DER BEDINGUNGSLKSEN KAPITULATION DER DEUTSCHEN STREITKRAFTE GEGENUBER DEM OBERBEFEHLSHABER DER ALLIIERTEN EXPEDITIONSSTREITKRAFTE UND DEM SOWYET-OBER-KOMMANDO. DONITZ GROßADMIRAL. Siegel. ^ Kershaw 2012, p. 376. ^ a b Chapter XV: The Victory Sealed. Globalsecurity.org. ^ a b 26 May 1945 – High Command Arrested. Trove.nla.gov.au (26 May 1945). ^ Oliver, Kingsley M. The RAF Regiment at War 1942-1946. Great Britain 2002: Pen & Sword. p. 118. ^ a b "Declaration Regarding the Defeat of Germany and the Assumption of Supreme Authority by Allied Powers; June 5, 1945". Lillian Goldman Law Library. Yale Law Library. 2008. Retrieved 30 November 2018. Kershaw, Ian (2012). The End: Hitler's Germany 1944–45. Penguin. ISBN 978-0-7139-9716-3. Jones, Michael (2015). After Hitler: The Last Days of the Second World War in Europe. John Murray Publishers Ltd. ISBN 978-1848544963. This page is based on the Wikipedia article Flensburg Government; it is used under the Creative Commons Attribution-ShareAlike 3.0 Unported License (CC-BY-SA). You may redistribute it, verbatim or modified, providing that you comply with the terms of the CC-BY-SA.